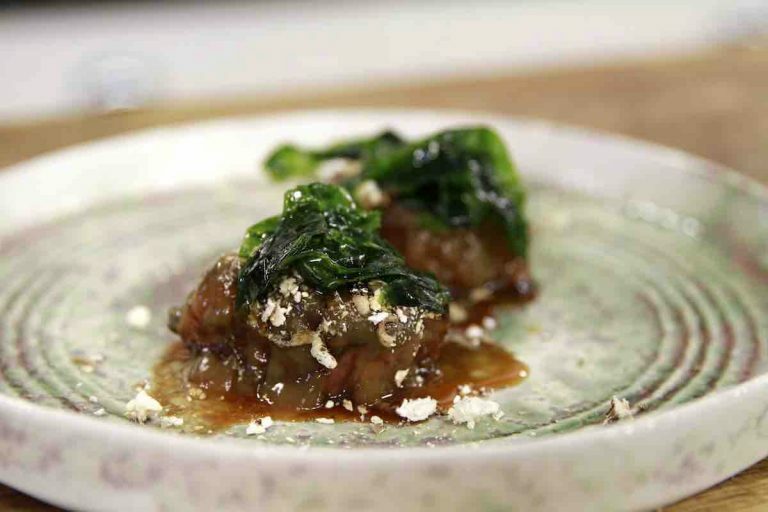 Gareth Ward's Welsh Wagyu Beef Rib with Shiitakes is a really special dish. The preparation starts 3 days before serving as the beef rib is submerged in brine. This tenderises it ready to create this amazing plate of food! It is served with a "flavour bomb" shiitake ketchup. To begin, brine the beef rib. Combine the salt and water in a large container, stirring until dissolved, and add the beef rib, ensuring it is completely submerged. Leave to brine for 3 days in the fridge. Two days before serving, preheat a water bath to 70°C. Remove the beef from the brine, rinse thoroughly and add to a vacuum bag. Seal and cook until completely soft, for a minimum of 48 hours. Once the beef is completely cooked, remove from the water bath and allow to cool. Chill overnight in the fridge until set. Cut into four portions and keep in the fridge. To make the dehydrated shiitakes, preheat a dehydrator to 140°C. Place the shiitakes on a dehydrator mat and leave to dry until completely crisp, for about 1 hour. For the shiitake ketchup, add the hot water and dried shiitakes to a bowl and leave to infuse for 1 hour. Pass through a sieve, discarding the shiitakes, and place the liquid in a pan. Bring to the boil with the agar agar then pass again into a container. Chill until firm enough to cut into cubes. Meanwhile, make the dressings. Place a pan over a high heat and add a good coating of oil. Once very hot, add the shiitakes and fry until dark and crispy. Remove from the heat, add the soy sauce and allow the mixture to infuse. Pass the liquid through a muslin cloth, squeezing out all of the liquid, and set aside at room temperature. For the soy dressing, combine all the ingredients in a bowl and whisk together. Store in the fridge until ready to use. When the mushroom ketchup gel has set, combine the sugar and vinegar in a blender and blitz together with the cubes of set mushroom stock until smooth. Pass off and chill before checking the seasoning once cold. If needed, add salt and rice wine vinegar to taste. Preheat a deep pan of oil or deep-fryer to 210°C. Add the wild rice to the hot oil, cooking until puffed up. Drain, place on kitchen paper and season with a little salt. When ready to finish the beef, preheat a barbecue. Once hot, brush the portions of beef with a little vegetable oil and sear the for a couple of minutes on each side until caramelised. Place the beef on plates and cover with the shiitake ketchup. Dress the sea lettuce with the soy dressing and place on top of the ketchup. Sprinkle over the wild rice and dehydrated shiitakes. Just before serving, add a teaspoon of the shiitake dressing to each plate.